Instructional podcasts and videos aren’t instructional if no-one learns. And as we share in our media workshops for workplace learning professionals, the formula for learning is understand + remember + apply. So what do you do in content like micro videos to help people remember the skill or knowledge you’re sharing? Creative repetition is a key principle we teach in our media workshops for trainers to help folks remember the content. This simple principle is based on the notion that the more you perform a task, the easier it is to remember and apply it in the future. Sure, repetition in media content is different to rehearsal and practice but they’re related. Have you ever noticed that the more you tell the same joke, in different places and at different times, the more fluent it becomes? The less errors you make and the more dynamic it becomes? This is an everyday example of practice. Rehearsal and practice are key to building memory and they happen because the brain draws memories from the long term memory into the short term memory multiple times. The more this happens, the stronger the pathway to that memory. In a way, it’s like walking down a dirt path. The more you take that path, the more you pound that pathway, making it easier to follow next time. When it comes to video, we can’t force the learner to do that work of practice. For all we know, they might watch the video, then forget it. However, if we repeat key points time and time again, and do so in an engaging way that keeps them focused, we can lead them to engage in more retrieval and cognitive processing. This is nothing new, even though many people don’t understand it in cognitive terms. It’s a technique that’s been used in marketing for as long as anyone can remember. That’s why they repeat the phone number at the end of a radio ad. Or show lots of similar pictures about the same product or service to reinforce the memory. It’s also a techniques that’s been hashed to death in politics. Ever noticed that when a politician is asked a question, s/he repeats the same old line over and over. Political strategists know that the more they repeat it, the more it will become accepted and remembered. It’s all part and parcel of that concept, “staying on message”. In cognitive science terms, we facilitate the retrieval process when we repeat something over and over. So for your instructional videos, focus on one key learning objective and repeat it over and again. That will facilitate the retrieval process. Or will it? The problem with repeating the same thing over and over is that it gets boring. After someone has said something once, we tune out when they repeat it, right? How do we get them to process the repetition more than once? If we repeat the same key learning point (repetition), but repeat it in a different way every time we do so (creatively conveying it in a different way), we trick the viewer into thinking they are processing something new. But in fact, they are drawing on the same or similar memories to make sense of the same point. And you increase the chances of repetition. 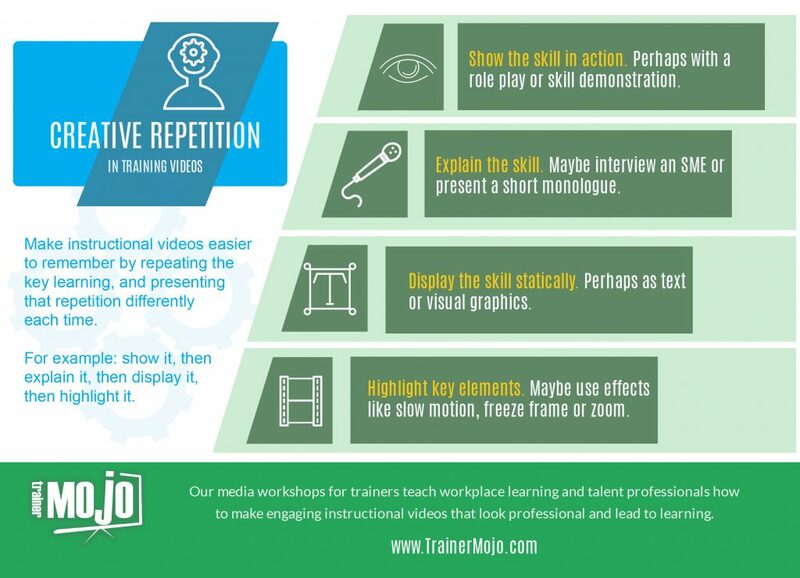 Creative repetition brings together the role of retrieval in memory formation, and what Jonathan Halls calls the Universal Principle of Change, to help make your instructional videos be more memorable. So how does it work? In a nutshell, plan to have just one learning objective in your instructional video. Then, repeat the key point in different ways from different perspectives to reinforce it. For example, in a customer service video you might show a role play that demonstrates an important behavior. You can repeat it (creatively) in a different way by cutting to an interview a subject matter expert explaining why it’s an important behavior. Then, cut to a text or visual graphic that summarizes it. If there’s a key psychomotor element to the behavior, you might repeat the learning by using an effect such as slow motion or freeze framing to emphasize it. Anyway, this is not meant to be a textbook! 🙂 Simply a short description to accompany our infographic. You can learn more about it in his books Rapid Video for Trainers, and Rapid Media for Trainers. If you’d like to learn how to put this in action, sing up to one of the public workshops we facilitate through the Association for Talent Development (ATD) or we can bring a media workshop in-house for all your trainers. Call us for details!